Tuesday, January 16, 2018 - Flaunt Your Skills! Today was the first day in four, that I have been out of my bed for any length of time or left the house. I drew The Magician from the Ukiyoe Tarot before I left the house this morning, but I did not have time to write up a proper interpretation. When I finally finished my appointments it took a while to get to a place with internet so here I am. 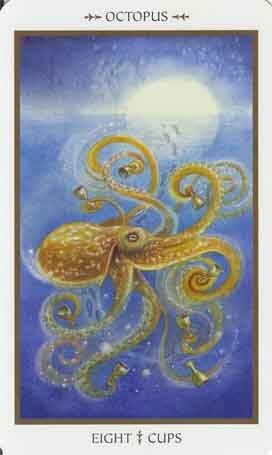 If I were picking a card for myself today, it would be the Eight of Cups from the Animals Divine deck, but that's a post for another day. I LOVE this representation of the magician for many reasons. The magician represents, skills, talent, well rounded ability. I find it can also point out to you that you have underutilized abilities, skills you should hone, talents as yet undiscovered or revealed or that your true abilities may not be recognized by others either because you fly below the radar or because you are being overlooked. This particular magician has the tools of his trade or items that represent his skills laid out in front of them. In this case, the items represent the four suits in this deck and a black box, representing the tarot deck, it's secrets tied with a ribbon. It also reminds me of the tradition of putting objects in front of a one year old, and the first item the child picks up predicts the direction the child's life will go. This tradition may have started in China and Japan but is practiced in many countries. According to the booklet that accompanies the deck, our magician appears as a "country bumpkin" in costume. He looks as if he might be traveling as a sideshow act for Kabuki, part of something larger, but working alone. He is "the master of the tarot" however people may see him merely as an entertainer doing card tricks. Is that how he wants to be seen? This description gives us more to ponder. So, get down with your mad skills, people! What have you mastered? Are you good at one thing or well rounded? Could you diversify your skill set with a little work? Are you more comfortable flying under the radar or are you owning it? Could you use more confidence? Or are you a bit of a conceited asshat about your value? Should you be taking credit for what you are contributing? If you are about to start a project, what skills can you contribute? Or maybe this is a nudge that you need to find a magician type person to help you! It's all about having the right tools and knowing how to use them!